That time of year has arrived again when we start preparing for Christmas (or just thinking about it...). A great way to decorate your home and tree is to make your own decorations. This give a wonderful personal touch. 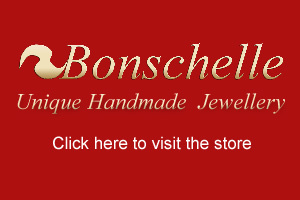 At Bonschelle we've been having some fun time making some decorations to hang. 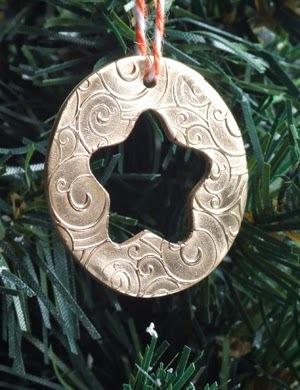 Metal Clay makes making decorations quick and easy and the results look luxurious. These were made with cookie cutters and stencils. You can easily make your own stencil designs using card - just draw your design and cut it out with a sharp craft knife. The clay was textured with a pretty swirl pattern, fitting for the season. Once dry and fired the piece was polished using radial polishing wheels, giving a warm, luxurious look. There are so many variations that could be done such as adding faux crystals or coloured resin. These would even make lovely small gifts or gift tags. We can't wait to hang these!